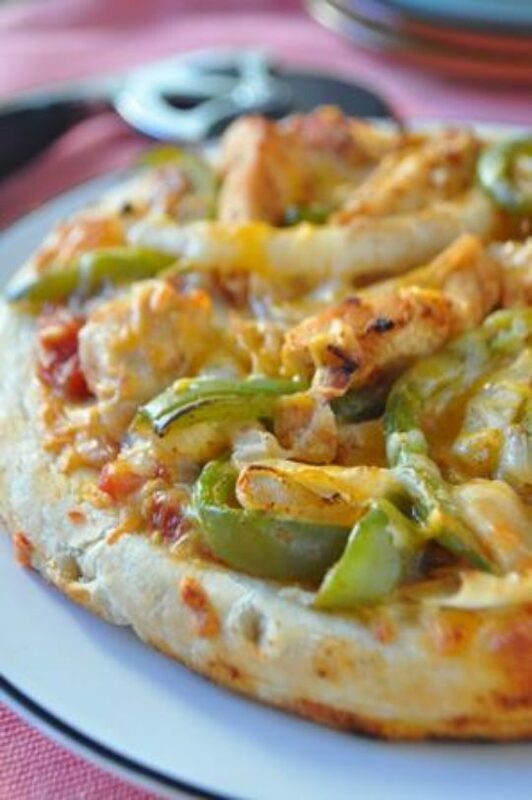 Fajita and pizza together in one recipe can only mean instantaneous deliciousness. This recipe is from Holly Clegg's trim&TERRIFIC KITCHEN 101: Secrets to Cooking Confidence: Cooking Basics Plus 150 Easy Healthy Recipes. Preheat oven 425° F. degrees. Coat pizza pan with nonstick cooking spray. In bowl, combine chicken with chili powder; set aside. In large skillet coated with nonstick cooking spray, sauté onion and green pepper, cooking until crisp tender. Unroll dough and place in pan; starting at center, press out with hands. Bake 6 minutes or until light golden brown. Remove from oven and spoon chicken and onion mixture over partially baked crust. Spoon picante sauce over chicken and sprinkle with cheese. Return to oven and bake 10-12 minutes.